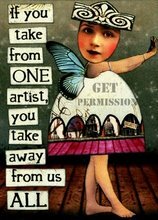 This year, I'm participating in Dirty Footprints Studio's third annual 21 SECRETS, an online Art Journaling workshop where Art Journaling techniques, methods, and approaches are taught by 21 different artists. In 21 SECRETS, we choose the order in which we take the 21 classes. With so many diverse topics and artists, it's hard to know where to start. The first class that I've completed is Dale Anne Potter's Personal Acts of Kindness workshop. Based on the idea that we must love ourselves before we can love others (a concept with which I heartily concur), we are designing and writing postcards, documenting what we like/love about ourselves. The idea is that we can pull these cards out on days when the world is a little rough, and recover our spirits. They're housed in a cute little envelope album that we make from scratch. I really like the way the finished project came out, and I'm looking forward to getting the postcards in the mail. Materials used include 7 Gypsies tissue; Graphic 45 Old Curiosity Shoppe stamps, My Minds Eye Market Street/Madison Avenue papers and labels, Cosmo Cricket Tiny Type letters, and Tattered Angels Glimmer Mist. I am addicted to making mini albums and books. I have dozens of them, almost all of them empty, stacked up in my studio. I always have good intentions that they will be completed. As soon as I get the photos processed. As soon as I journal the events. As soon as I finish that sketch I want to include. I never seem to run out of excuses. For my upcoming trip to Chicago, I'm trying something different. I created an album before the trip. There are places to journal, envelopes in which to tuck little bits of memorabilia, and plenty of room for photos. I really like the way it turned out. I used a 7 Gypsies spiral envelope album and Teresa Collins Travel Ledger kit. I inserted a folder in the back of the book to hold a mini art journal.